SINGAPORE, 1 August 2017 – CMIA Capital Partners, in partnership with Affin Hwang Asset Management (“AHAM”), have today led the acquisition of a majority stake in Bitsmedia Holdings Limited. (“Bitsmedia”). Bitsmedia is the company behind Muslim Pro, the world’s number one mobile application serving the global Muslim population. The mobile application provides Muslims with accurate prayer times regardless of where they are in the world, as well as features such as Qibla (the direction of prayer), Quran, Duas, a Zakat calculator, and even includes a community forum, amongst others. To-date, Muslim Pro has achieved 45 million downloads, more than 10 million Monthly Average Users (“MAU”) and more than 2 million Daily Average Users (“DAU”). The mobile application is available in more than 15 languages, including in Arabic, Chinese, English, French, German, Indonesian, Malay and Urdu. It is available on both Android and iOS devices. Bitsmedia is a mobile applications business established in 2009 and headquartered in Singapore. 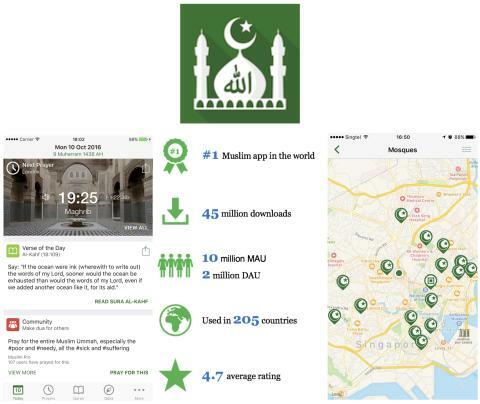 After developing applications for corporate clients and publishing a few of its own titles, Bitsmedia decided to focus on the Muslim Pro application back in 2012 making it the world #1 mobile application serving the global Muslim population. CMIA Capital Partners is a private equity firm focused on control and growth capital investments in mid-sized businesses in China and Southeast Asia. Established in 2003, CMIA has to-date led more than $1 billion in investments across various industries and sectors. CMIA’s current investment focus has been in the consumer and technology sectors. Earlier this year, CMIA led a $50 million investment in WatchBox, a world leader in the e-commerce of pre-owned luxury watches, as well as a $15 million investment in Well Bright Foods, China’s leading meat processing business and only Wagyu cattle farming company. CMIA is headquartered in Singapore, with presence in Hong Kong, Shanghai and Chongqing. CMIA is a Registered Fund Management Company under the Securities Futures Act (Chapter 289) administered by the Monetary Authority of Singapore. For more information, please visit www.cmia.com. Affin Hwang Asset Management Berhad ("Affin Hwang AM") is an independently managed bank-backed asset management firm that started its roots in 2001 serving the needs of corporates, institutions, pension funds, government linked companies, high net worth individuals and the mass affluent. We specialise in customised solutions and invest into equities, bonds, money market, structured products and other alternative investment instruments to generate returns for our clients. Our product offerings include unit trust funds, private retirement scheme, feeder funds, Shariah-compliant funds, cash management solutions, private mandates and other wealth management solutions. We have a strong parentage with AFFIN Holdings being a major home-grown financial services conglomerate which focuses on commercial, Islamic and investment banking services, money broking, fund management and underwriting of life and general insurance business. Our other shareholder includes Nikko Asset Management International Limited, wholly owned by Tokyo-based Nikko Asset Management Company Limited, a leading specialist Asian investment management firm.